You’d be amazed at the technology that goes into modern flashlights. I’m not talking about the cheap and cheerful/nasty ones you can pick up for £1 at the checkout at Tesco or a petrol station, I mean “proper” flashlights. Precision machined reflectors shape the beam pattern and balance the throw and spill. Cutting edge LEDs generate insane amounts of light. Clever electronics regulate the output to ensure a constant and steady output for as long as possible before dimming, squeezing the maximum out of the batteries. And that’s not to mention the various user interfaces that allow for a number of different light levels along with other modes such as strobe, S.O.S. and beacon. These lights cost between “quite a lot” and “eye-watering” on the scale of wallet pain. Believe me, I know, I have quite a few of them. Yes folks, my name is Paul and I am a flashaholic. Uniquefire sent us one of their flashlights to take a look at. At £18 I really didn’t expect a lot, but two things intrigued me, the name of the light and the specification/description from the manufacturer, but I’ll get to those later. So let’s judge the light on its own merits. Is it any good? Well, yes and no. For £18 it falls firmly into the cheap but useful pigeon hole. It does feel quite solidly made, which surprised me. I initially thought the tail button glowed in the dark which would have been a really nice feature, it alas no, it’s just green. The light can be powered by either an 18650 battery or 3x AAA batteries. The former will provide more power, but they are not exactly common, so most people will opt for the much more readily available AAA option. There are 5 modes available – high, medium, low, strobe and S.O.S. which are cycled through by half-pressing the tail button. The main gimmick of the flashlight is the zoom function. This allows the output to transition between a wide flood or a tight and narrow beam for maximum throw. It all sounds very positive, but there are some issues. The reflector, what there is of it, is incredibly shallow and untextured. This is compensated by a parabolic lens to magnify the light from the large LED. It’s a common feature on cheaper lights. Putting the light on high mode the flashlight does a decent job at illuminating a wide area, perhaps 5m wide, but only for about 3m in front of you. Pulling the head away from the body create a telescoping effect which tightens the beam to a bright but very narrow profile that stretches out perhaps 80-100m. The beam pattern is horrible though. It’s square, full of artefacts and clearly shows the cheapness of the light. I compared it against my little Zebralight SC51, a single AA light that, although almost twice the price, is also a fraction of the size and weight. It has an output of 200 lumens, so it should be interesting to see the comparison. As you can see from the pictures below, the zebralight may lack the zooming feature, but a properly engineered reflector can create simultaneous spill and throw, giving a much more versatile beam. Now onto my issues with the name and spec. The light is called the “XM-L2”. I have seen this particular sales tactic before. It leads the buyer to believe that the light has an XM-L2 LED, a high output, super efficient component in it and not the sort of LED one might find in a low-end light. I don’t know what LED is actually in this. The spec from the company is vague, non-specific and potentially misleading. Generally, companies will provide output and runtimes for each mode, but sadly not in this case. 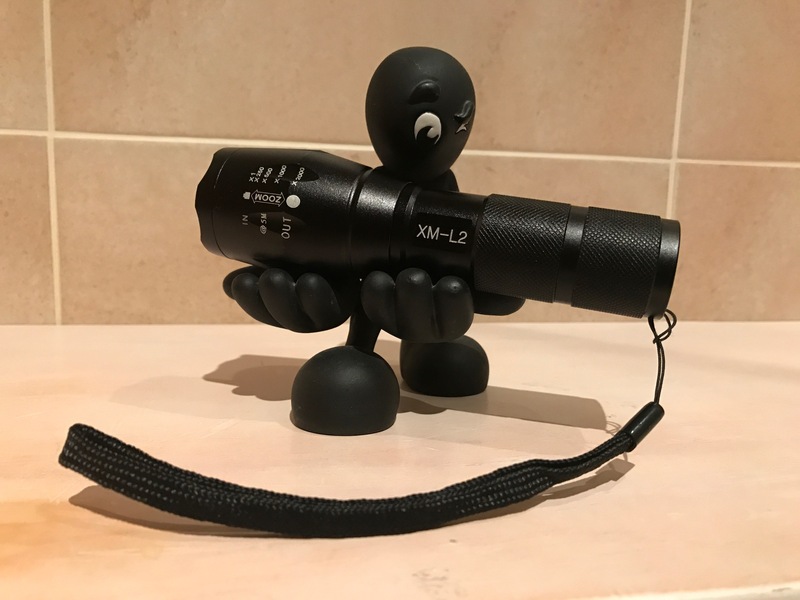 You can see that the 200-lumen zebralight appears to be putting out more light, yet the XM-L2 claims to put out 600-1000 lumens in its somewhat confusing information. I don’t think so. Overall, this light isn’t bad for the money, and if it marketed itself as such, I wouldn’t have a problem with it. However, I take issue with how it appears to be presenting itself as a high-end light when it is very clearly not. Pick one up from Amazon here.